On Monday, March 27th, I presented House Bill 1735 to the Committee on Elections. House Bill 1735 has a few components to it. Under current law, there is no express statutory authority to remove, replace, or reassign an election worker who is being disruptive in a polling location or is willfully disobeying the Texas Election Code. House Bill 1735 seeks to remedy this situation by putting a procedure in place. Additionally, there is currently no standing to seek relief from an incorrect determination by the Early Voting Ballot Board. House Bill 1735 seeks to remedy this as well. Finally, it is unclear and somewhat confusing how the current oath administered under the Election Code applies to the Early Voting Ballot Board members and the Central Counting Station officers. These members are not present at polling stations and therefore the oath doesn't quite make any sense. House Bill 1735 seeks to clarify this issue by providing a more appropriate oath. On Tuesday, March 28th, I presented House Bill 2252 to the committee on Land & Resource Management. House Bill 2252 provides for creating and maintaining a coastal barrier study. While the Texas Gulf Coast is a vital part of Texas' vibrant economy, its location makes the region and its people vulnerable to hurricanes and other damaging weather events. The region is home to various lucrative industries, including healthcare, tourism, maritime activity, education, aerospace, chemical, and oil and gas, and also to one of the largest and most important concentrations of refineries in the nation. In addition to the vast economic interests in the area, the region hosts environmental interests and recreational activities, such as boating and fishing. Protecting these industries and interests that are vital to the health of Texas' economy is important. HB 2252 seeks to provide for the study of a protection concept developed in response to the extensive surge damage caused by previous hurricanes in Texas. 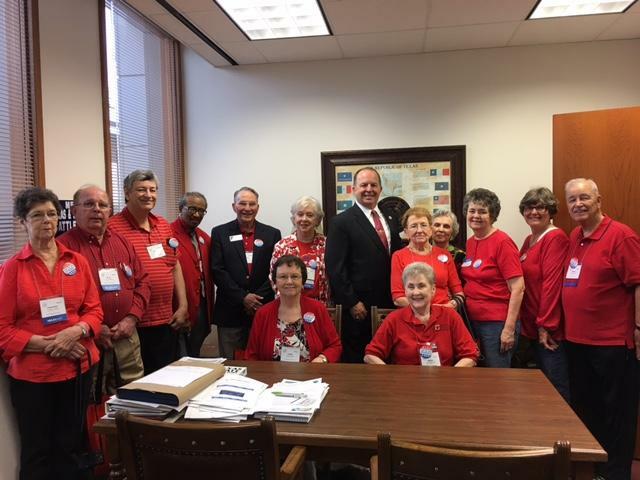 I was honored to visit with some constituents who came out for Texas Retired Teachers Association Day at the Capitol. Texas Land Commissioner George P. Bush announced the General Land Office (GLO) has completed the Texas Coastal Resiliency Master Plan, the first inclusive coastal plan for the state with the 6th longest coastline. To review the executive summary, master plan and technical report, visit the GLO's Hurricane Preparedness & Planning webpage. The Texas Coastal Resiliency Master Plan better prepares the state for the next hurricane to hit the Texas Coast by creating a framework for coastal management, restoration and protection measures. The plan also guides the GLO in the execution of its responsibilities and provides Texas coastal communities with a set of scientifically sound, feasible and cost-effective coastal resiliency projects. Galveston County, TX - A new marketing piece by Galveston County's Economic Development Department aims to attract new industry to the area by focusing on an outstanding quality of life and ample business opportunity. 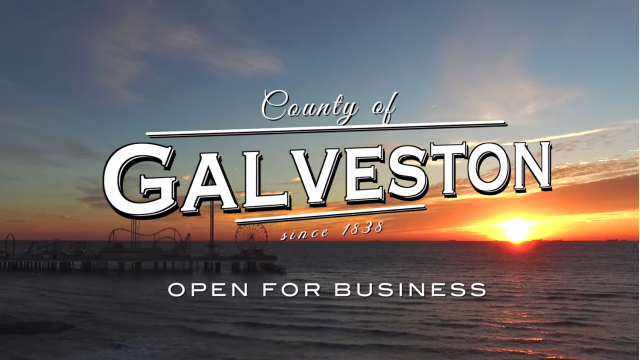 The video is a compilation of Galveston County's many attributes that might appeal to businesses looking for a new location in areas such as workforce, education, transportation, infrastructure and an abundance of shovel-ready sites. Economic Development Director C.B. "Bix" Rathburn said the trick was to show as much of what Galveston County has to offer from each of its communities in only a minute and a half. "We truly are 'a place where a vibrant past combines with a diverse present to cultivate a bright future,'" Rathburn said, quoting the video. "So much of that has to do with our top schools, medical care, abundant land and pro-business environment." The video will be the centerpiece of a new Galveston County Economic Development website designed to enhance business recruitment, retention and expansion for Galveston County. The new website will be released at the end of Spring 2017. Bella Vista Productions produced the video. Last week I wrote about laying out House Bill 1727 (relating to the issuance of certain search warrants). This week it was voted favorably out of committee so now we wait for it to go to the full House. I am proud to team up with the Texas Hospitality Association (THA) to fight underage drinking and to promote alcohol responsibility through a statewide poster contest that will award four 2017 graduating high school seniors $10,000 in educational scholarships. THA will award a $5,000 scholarship to the Texas high school senior who submit the best poster conveying the message: "If you are under 21, it's illegal to consume or purchase alcoholic beverages in Texas." A $2,500 scholarship will go to 2nd place, $1,500 for 3rd and $1,000 for 4th. The winning posters will be used in a statewide alcohol awareness campaign. The contest is open to all 2017 Texas high school seniors. Artwork must be an original design and may be computer or electronically generated, hand drawn or photographed. Students have until May 5 to submit their poster to THA. For complete details on the poster contest, click HERE. 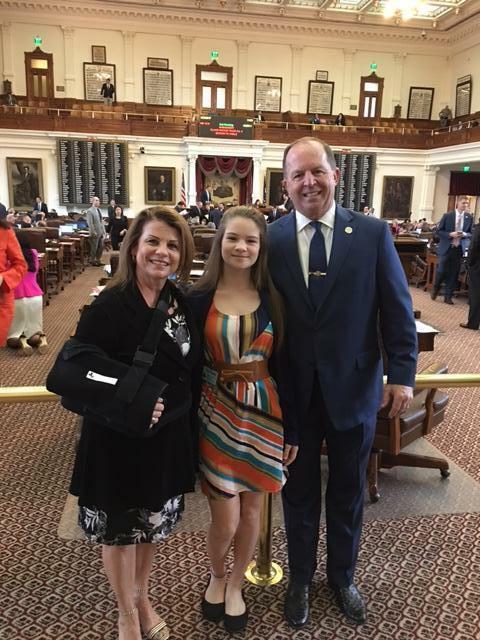 On Tuesday, March 28th, my wife, Cheryl, and granddaughter, Abigaile, visited me. Abigaile served as an honorary House Page. This program gives children an opportunity to shadow House Sergeants and participate in House floor activities.